Not something the average person would run into, but more and more commercial cables and connectors are being listed as “Low PIM.” So, even if you’re not a person who normally pays attention to commercial stuff you might find yourself asking about it. PIM stands for “passive intermodulation” and it’s a bad thing. It’s the interference that happens in a connection when you’re mixing more than one frequency on the same cable. Like, if you’re connecting wires in a cell tower and you need to mix the signals from multiple antennas. This sort of thing happens all the time in the world of commercial distribution, although it hardly ever happens in home setups. So if you’re working with cell towers, wireless internet, broadcasting, or that sort of thing, you want the lowest PIM possible. Ideally I guess you’d want no PIM at all. What is weird about it, from the point of view of most people, is that connectors are usually referred to as “Low PIM” if there is any mention of it at all. You would think that these manufacturers would be falling all over themselves to show just how low their PIM was, but they aren’t. They just want to let you know that they meet the Low PIM standards, which mean that the strength of the interference is less than 1/16,000,000,000,000,000 of that of the carrier (in more science-y terms, <-160dBc.) I guess that’s all that the people who do this stuff need to know. I don’t know, that looks like a pretty low number to me. It’s important because these commercial people are trying to standardize on new connector types that are smaller and therefore they can be put more densely in cell tower installations. 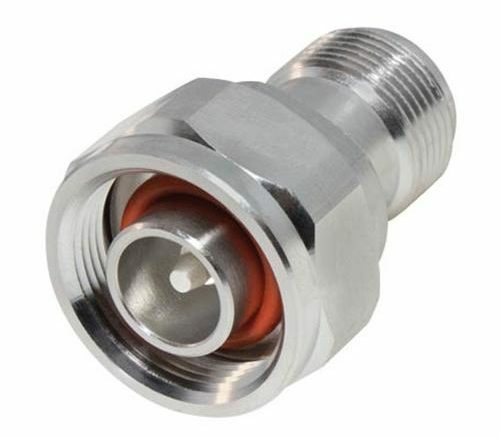 The current connector, the 7/16 (7mm inner measurement, 16mm outer measurement) requires a mounting plate roughly two inches in size. Newer connectors like the 4.1/9.5 connector can fit on a mounting plate one inch in size, and that means four times as many connectors in the same space. That can make things a lot easier when you’re trying to deal with local ordinances that require cell towers to be as small as possible. There are much smaller connectors of course (think of a headphone plug which is 3.5mm outer measurement) but they have much higher PIM. And PIM is one of the most important things for these folks. So you’re not ever going to see a headphone plug on a cell tower. It’s always going to be one of these fancy commercial ones with a funny name, and of course, a very low PIM. Can you run a DIRECTV SWM line 700 feet?